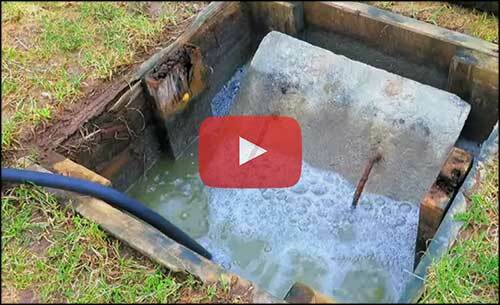 How Do I Unclog a Septic Leach Field? 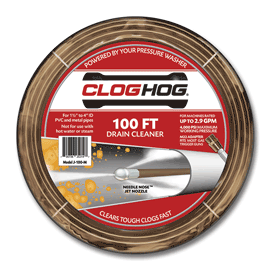 It is often possible to clean and renew a clogged septic leach field instead of replacing the drain field lines. You can use a sewer jetter to clean septic leach field lines from 2" to 6" ID. A sewer jetter can help you scrub away sticky sludge and flush out dirty residue to help reduce the need for subsequent cleaning of the lines. Powering the sewer jetter with a gas pressure washer rated 2.0 GPM to 4.0 GPM can make the job much easier, since septic sludge can take significant force to scrub and flush out of the line. Powering the sewer jetter with a smaller electric machine is not recommended for cleaning septic fields. 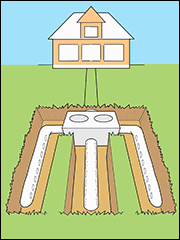 It's usually recommended to locate and expose through digging the downhill end of each septic line, digging a large enough hole under each end for the sludge to flow out and accumulate as you clean the opened line. Another approach is to locate and expose the distribution box and then feed the sewer jetter by hand through each line that exits the box. However it's more difficult to thoroughly flush the sludge uphill toward the opened box, and you'll usually need to pump out the residue that flows back into the box. For more details you can watch this 3 minute video (part of Steve Maxwell's do‑it‑yourself Septic System Rescue video course). Important: a sewer jetter that's powered by your pressure washer can't clean septic field lines made of flexible hose less than 2" ID, or septic fields that consist of interlocking plastic chambers greater than 6" ID. If there are many fine tree roots, you may be able to loosen the roots with a sewer jetter, and then pull out the long strings of roots by hand or by using a rented mechanical drum auger that has a root cutting blade. If there are larger tree roots in the line, you might need to start by using a rented mechanical drum auger with a root cutting blade to dislodge the roots, and then flush the line with a sewer jetter to remove the septic sludge. Connect the drain cleaner to your trigger gun, start the pressure washer, and then guide the nozzle at least a foot into the exposed septic field line opening before you start the flow of water. Guide the sewer jetter into the line as you squeeze the trigger. For more thorough cleaning, every few feet pull back about halfway and then continue moving forward. After you have finished cleaning the line, pull the drain cleaner out. 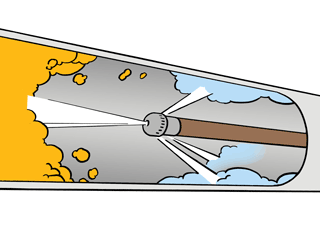 Use care to release the trigger to stop the flow of water before the nozzle reaches the opening. 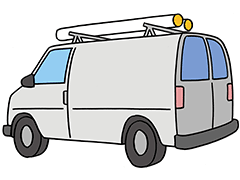 Then replace any fittings, check the system, and restore the fill dirt.